So I’ve been in Freiburg for just over a week, and I’ve lived here for just under a week. I figure that by now I have just enough authority to rank my five favorite things about the city, so here goes! 4. The architecture: Freiburg is an eclectic mix of new and old. Many of the streets and sidewalks, especially in the city center and the Altstadt, are cobbled. The most recognizable landmarks are the Münster (the cathedral, which is currently being renovated) and the Rathaus (city hall), both of which are pretty old, like, hundreds of years old. I love being part of the city’s history just by living here. But there are also modern buildings, gleaming glass windows, wind energy generators in the hills, and lots of solar panels. It’s kind of cool having one foot in the past and one in the future. 3. The history: There are just all kinds of things to learn. For one, the Battle of Britain in WWII was started after a German air strike aiming for France accidentally hit Freiburg. Germany’s leaders blamed it on England and the airstrikes of London began. Interesting, huh? 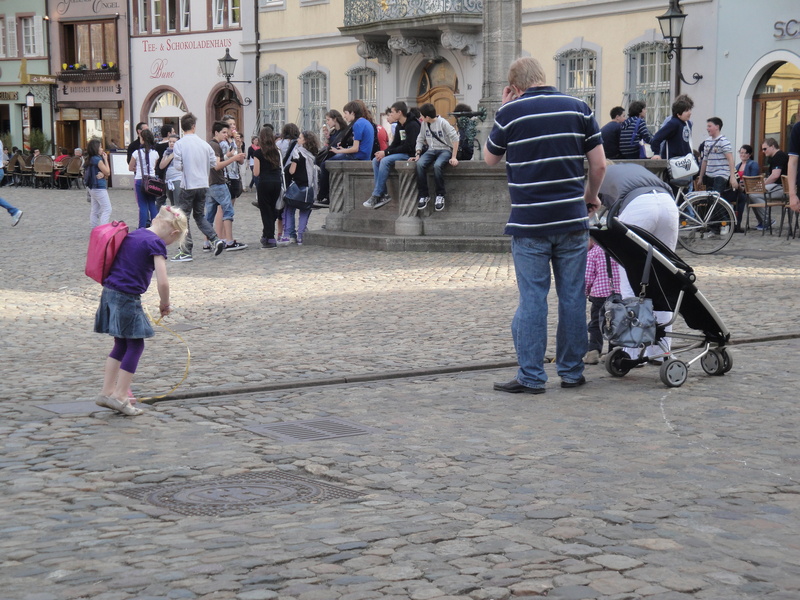 One really cool segment of Freiburg history is the Bächler system, these little… streams? ditches? gutters? I don’t know what to call them exactly. But they’re filled with clean, running water and they line all of the sidewalks and roads here. They were originally built to prevent fires… in the case of a fire, the Bächler can be dammed up, flooding the streets and putting out a fire before it can cause much damage. And it works! There hasn’t been a major fire here since the Bächler were built. Just don’t fall into the Bächler.. that means you’re destined to marry a Freiburger. And also that you will have wet shoes. 2. The great outdoors: Freiburg is a very outdoorsy city. Situated in the Schwarzwald (black forest) it is surrounded by beautiful tree-covered hills and kind of has no say in the matter. But Freiburgers are outside!! All the time! There are trails all over the place, and people use ‘em, man! The best are the older men and women who walk around with a walking stick in each hand. I kind of want to buy some. (Walking sticks, not elderly people.) This is also a huge biking city. Almost every walking path is either also a bike path or is right next to a bike path. Downtown, there are more bikes on the roads than cars. It’s a very useful way to get around. As for me, the debate still continues… Straßenbahn or Fahrrad?? Stay tuned. So there you have it! I realize that there is a lot of writing here for a Top Five list, but hey, I never claimed to be a concise individual.